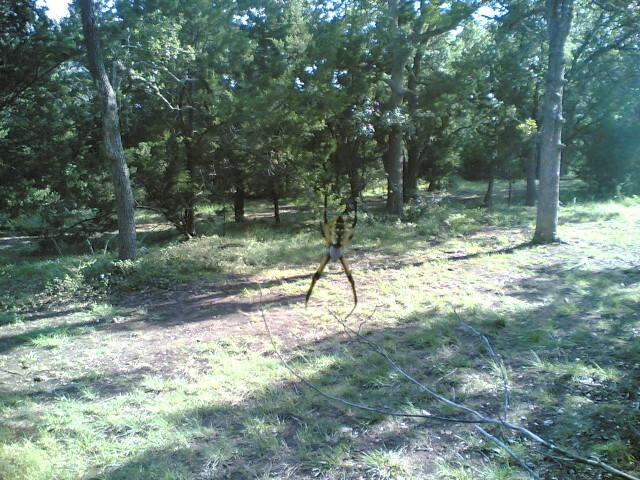 Those spiders are out here as well. And their yellow camouflage works well. I wonder if that thing will eat discs? Hole seven is a tough hole. You are on the left side of a stream. 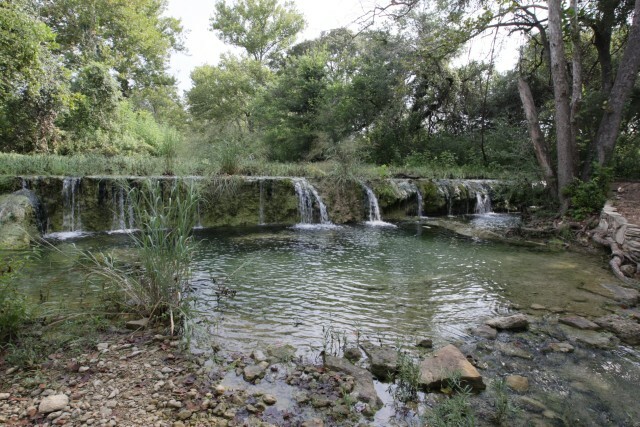 About 250 feet out is a waterfall and pond. Just to the right of that pond is a small “island” where the basket lies. There is a lot of vegetation providing a barrier along both sides. Man, that is really tempting to swim in! 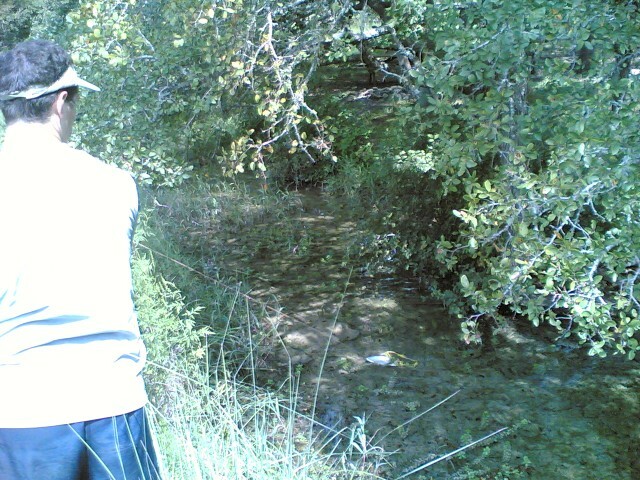 Along the left side of hole 16, there is water. You can’t see it through all of the trees and underbrush, but its there. Believe me. But then you really do not need believe, because John’s disc found the water. Fortunately, the water was rather clear. 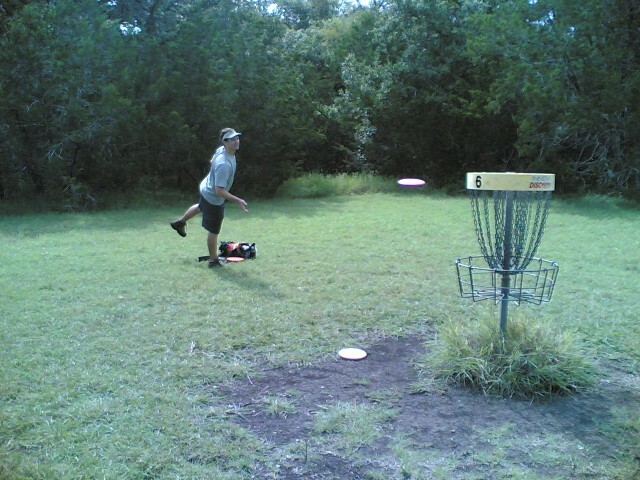 We met up with Jon at Mary Moore Searight park to practice for the upcoming tournament. I had a couple of good throws from the tees. Which led to birdies on 6 and 18. 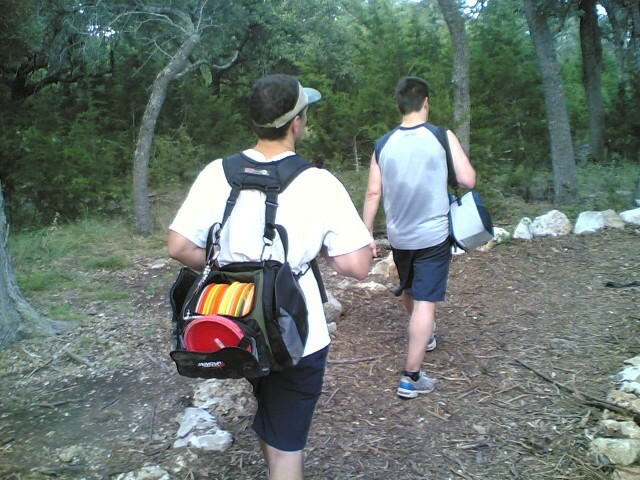 This entry was posted in Disc Golf on August 31, 2007 by Mark. 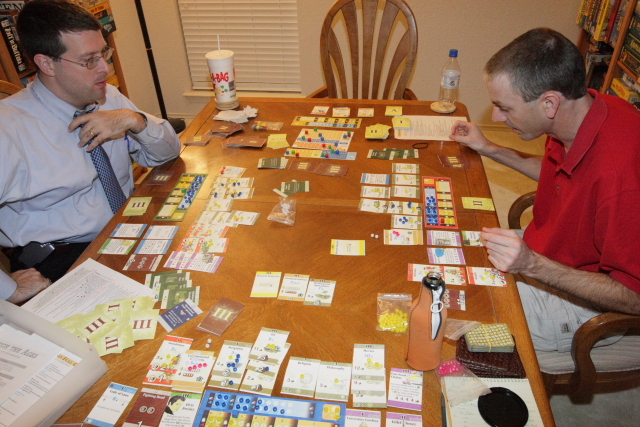 Mike and I wanted to play Phoenicia with five players, but that was nixxed by John. So, instead we played Notre Dame. I still don’t know what to think about this game. It has some good mechanisms. 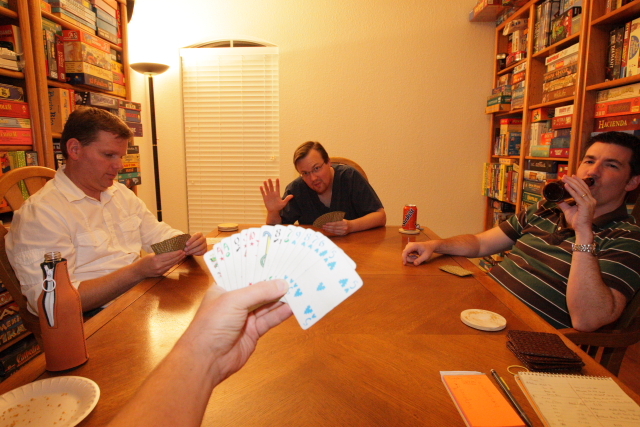 But it is really influenced by who is playing at the table. More specifically, it is heavily influenced by who is sitting at your right. In this game, it was John. And he filtered the cards that he passed me. I would mostly see the two different rat management cards. And sometimes the Notre Dame card. Never the move your vehicle around the board card. Which left me with no ability to pursue the travel around the board and collect a lot of tokens victory path. And I don’t like the luck involved of being able to draw your own Notre Dame card in the last pile of three before a scoring. All during the game, I kept drawing it in my first group of three cards. So, I got in there early and was able to see if others would go in there or not. On the second hand, I call Tichu with a one through Jack straight, a Dragon, a Dog, and a three. Unfortunately, a bomb stopped me. But you can’t predict when that will happen, so you just have to accept it. Doug was a little bit of a wimp tonight. He did not call Tichu three times and still went out first with no real competition. Fortunately, we were able to coast for the win before the other team caught up. This entry was posted in Gaming on August 30, 2007 by Mark. During the 42 session today, I was reminded again about a couple of the things that I do not like about 42. The first was the person overbidding what you really want to play. In this case, that person was me. The person to my right bid 41 and I was the last to bid. A bid of 41 means that you are going to only lose one trick and that trick will have no bones with points on them. Usually, the loosing trick will be a trump trick. However, my hand contained: 0:0, 5:5, 4:4, 4:5, 4:2, 4:1, and 4:0. In the unlikely 0:0:2 trump split I go down. So I overbid to one-mark. Which is pretty tame. It is definitely a two-mark bid. However, we were ahead and I did not want the other team to catch up more than necessary. Needless to say, I made my bid. The other thing I do not like is the desperation bonus bid. The other team was behind 5 to 0. My partner passes. The first person on the other team bids plunge (a three-mark bid signifying that he has the 6:6 and three other doubles). I cannot over bid so I pass. And, John, the last person (the other person on the team) increases the bid to four-marks. This is a bonus mark! John is going to call trump suit and lead anyways thanks to the plunge convention. But now the opposing team will win four marks instead of three. If the score were 6 to 3, and if the opposing team made the bid, they would win the game! Flawed. This entry was posted in 42 on August 30, 2007 by Mark. Marty, Harry, and I played Through the Ages tonight. 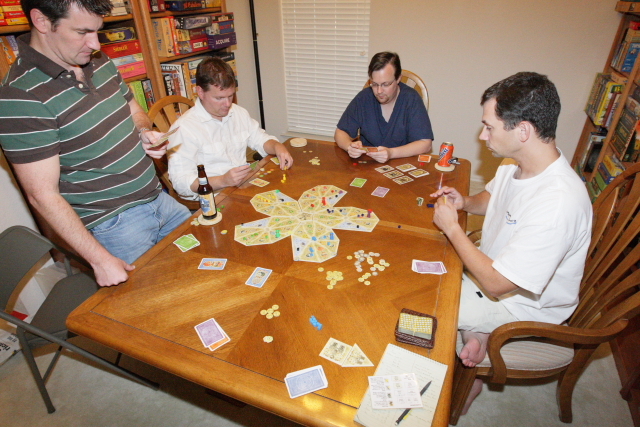 The three player game was pretty quick at three and a half hours long. I did pretty well with my leaders. Homer was first. This was the first time that I have played with him. I liked him because he gives you easier troop building and victory points for the troops. Michelangelo was next. I didn’t bother to get the St. Peter’s Basilica. Instead, I built the University Carolina which gave me much needed science income. I did build a theater though. They are certainly helpful later on in the game. And they give bonuses for certain leaders. Bach was next. This fit in perfectly with my theater strategy. Since I knew that there were some leader killing cards out there, I didn’t want to get too dependent on the leader bonuses. I built the Eiffel tower for a straight 4 victory point generation. And, what a surprise, an Iconoclasm came out and made me discard him. But Elvis was waiting in the wings. So I built the movies to get a good bonus. And Fast Food chains for a one time bonus. This game is all about being well rounded and still generating victory points. And my problem was my armies. Fortunately, I was just enough ahead in the first and second ages to not be attacked. Surprisingly enough, I made it through the third age with out any wars declared on me and only one attack on a colony which I let succeed. I was also surprised to see that no one kept up with me in culture point generation. I was at 12 and Marty and Harry were at 3 for a long while. And, by the end of the game, I was 50 points ahead of Marty. I didn’t do that well in the end game scoring, but my lead was too substantial to overcome. This entry was posted in Gaming on August 28, 2007 by Mark. This entry was posted in Web links on August 26, 2007 by Links. I haven’t been seeing any Mud Dauber’s nests hanging from under the soffits lately. And it seems that it may be because a new species has moved in. I wonder if these are Organ Pipe Mud Dauber’s residences? And I have no clue what insect is responsible for the tiny ones! Mini Mud Dauber’s? This entry was posted in Picture post on August 26, 2007 by Mark. It’s getting pretty dark out and I have busy making a pizza, but I had to take a picture. I thought it would be a good opportunity to take a HDR photo. 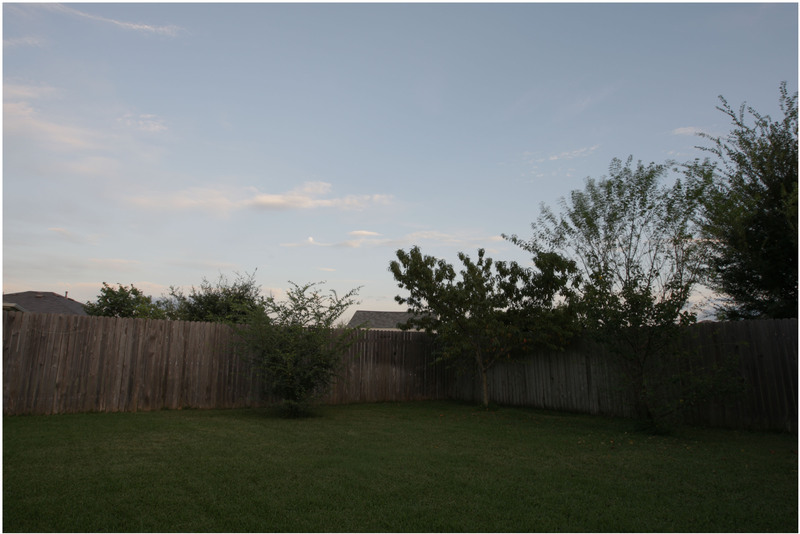 I used a tripod, the 16-35 lens, high speed mode, and set it to take a sequence of 5 photos at the following exposure compensations (-2, -1, 0, +1, +2). The only problem was a light wind gently moving some of the branches. This entry was posted in Picture post on August 25, 2007 by Mark. I went to Wilco again today but limited myself to three discs only: two mid-range discs: a Star TL and a Millennium Aurora Midrange Straight, and my putter, the Thumbtrac Birdie. For each shot, I would throw both mid-range discs. I need the practice. And when I putt, I putted with all three of my putters. 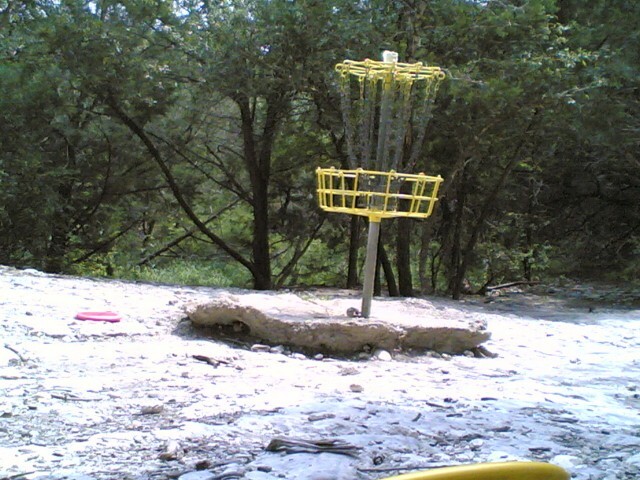 This entry was posted in Disc Golf on August 25, 2007 by Mark. 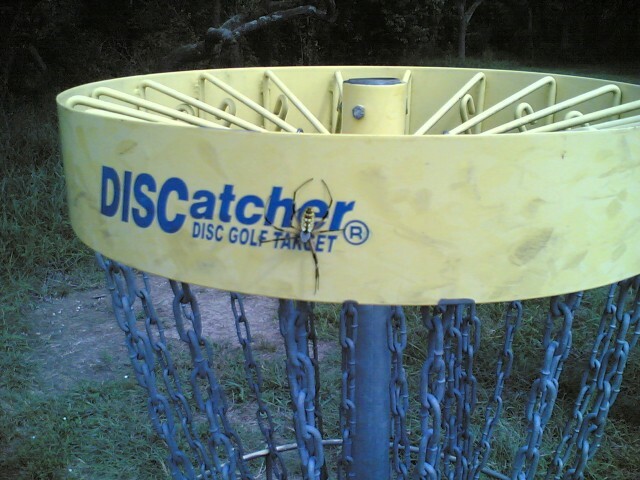 This entry was posted in Disc Golf on August 24, 2007 by Mark. 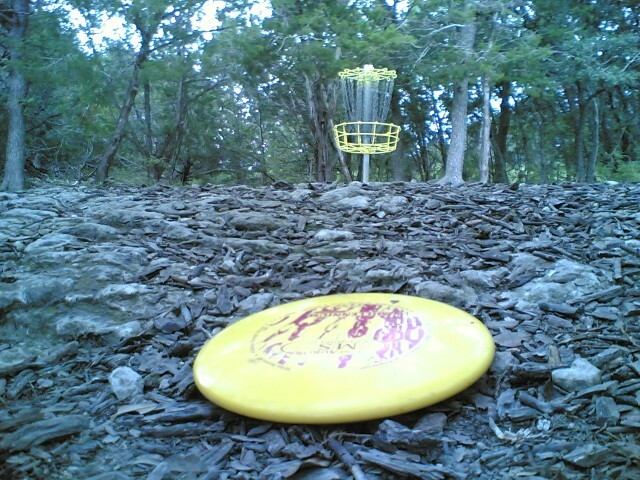 I drove down to Bartholomew District Park to take pictures of the course. However, that posed to be a problem. 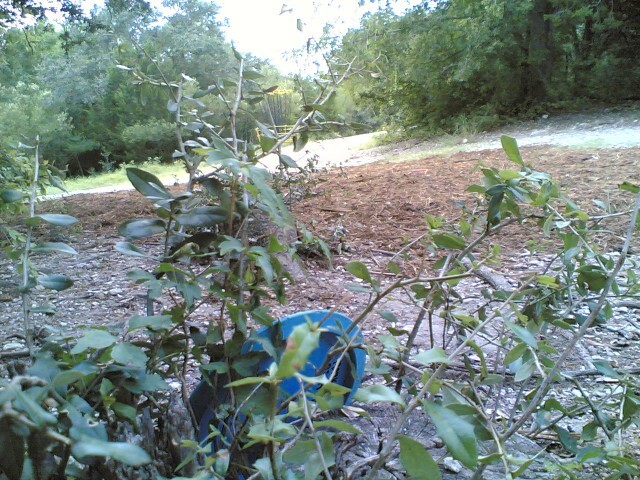 The park was abandoned and overgrown! Which is weird. Construction has been going on there for years now, but why abandon a city park? Especially one that has a swimming pool, basket ball courts, baseball fields, etc. 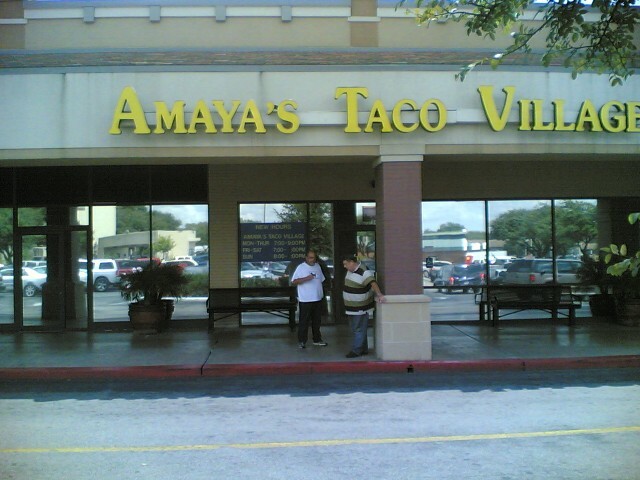 So I drove to Amaya’s Taco Village for some tacos. The place was packed as usual and I had to wait 20 minutes to get a seat. The only problem that I have with this place is that their cheese is rather poor quality. It seems like it is shredded Velveeta. This entry was posted in Interesting on August 24, 2007 by Mark.